We have recently taken a look into the Kind LED K5 XL1000 and we absolutely love it. It isn’t perfect, but we understand why this light has been sold a lot already. Find out our experiences in this review. Powerful lighting is an essential requirement for any indoor growing operation. Your grow light must be in affordable and energy efficient. Most importantly, the grow light that you choose should be as good as or better than natural sunlight. The best lights for indoor growing are usually expensive. You can go as high as your budget allows you to when it comes to quality and power. Therefore, it’s important to find the best grow light without having to go over your budget. I always recommend LED lights to other growers. They require a sizable investment up front, but you will be saving a lot of money with your utility bills. Find out how to choose the best LED growing light with this guide. 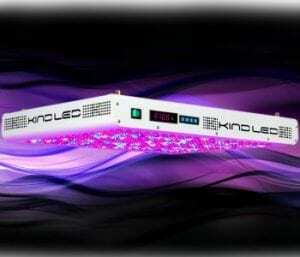 Kind LED K5 XL1000 is an award winning LED grow light that meets a lot of important criteria. It’s not a cheap LED light, but I do think it has a great price/quality ratio. The innovative features of the Kind LED K5 XL1000 make it a unique light in its price range. The Kind LED grow light has an impressive trophy cabinet! It won High Time’s ‘Gear of the Year’ award for four consecutive years. And it also won High Time’s ‘Best LED Innovation’ in 2017. Kind claims that the K5 XL1000 can replace a 1000-watt HPS setup. However, I think the maximum capacity for good results is equal to a 750 watt HPS light. The 320 diodes of the Kind K5 XL1000 LED grow light is a mix of 3w and 5w chips. The mix of diodes is unique compared to other usual LEDs. These grow lights normally use diodes of a single wattage. The 5-watt diodes offer great intensity and canopy penetration, but also consume more electricity and produce more heat. The 3-watt diodes step in to even things out. They have lower intensity, yet better energy efficiency and low heat output. It’s a bit of a disappointment that Kind LED grow light doesn’t disclose the exact breakdown of the 3w and 5w chips. However, whatever the ratio is, it’s getting the job done! Each diode is equipped with a 60-degree secondary lens. They focus the light, improving the intensity and penetration. Kind LED K5 XL1000 growing light uses only 630W to provide the same amount of light that a 750-watt HPS setup would. You will definitely have lower electricity bills with this LED grow light compared to an HPS setup. Great idea if you ask me. It’s important to remember that you only need to run the light on full power during the flowering stage of your plants. Most LED lights with dimmers pull the same amount of power even when you dim lights. The Kind LED K5 XL1000 however is equipped with pulse width modulation dimming. This gives this LED grow light the ability to consume power proportionate to the brightness of light that it gives out. You can also fully customize the intensity of Reds, Blues and Whites according to the needs of your plants. You will be saving more power by doing so. These innovative power saving features will pay for the LED light itself. You will save a lot of money on electricity bills. Also, the possibility to customize the output will result in better yields! 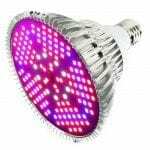 The low heat output of this LED grow light also helps you save electricity, as you won’t need extra fans and other cooling methods. 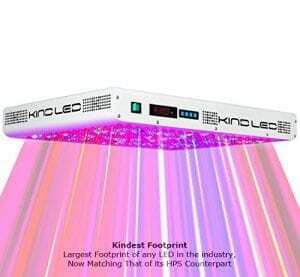 One of the best features of Kind LED K5 XL1000 grow light is its precision control. It is a great feature, made for professional growers. Precision control gives you complete control over the full 12-band spectrum as well as light cycles. This means that you can accurately mimic natural sunlight at different times of the day. And you can adjust the light settings to fit the exact requirements of your plants. This feature is way more effective and advanced than the usual Veg/Bloom switch that most LED grow lights have. The remote control supports multiple units (up to 100), which is great for growers with more than one light. The timer also has eight different stages of intensity. With this ‘Mother Earth’ feature, you can easily mimic the gentle increase of intensity of the sun. Think of the morning sun, full day sun and the slow decrease of light during sunset. These innovative features give growers with the Kind LED K5 XL1000 grow light a lot of control over the way that their plants receive light. Master these features and your plants will grow like never before. The spectrum of Kind K5 XL1000 LED grow light is fully customizable. This gives you the ability to adjust the spectrum to suit any growth stage of your plants. 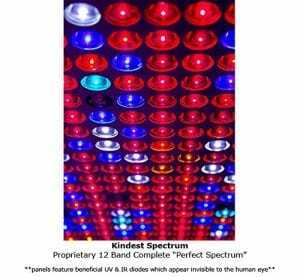 The 12-band spectrum of Kind K5 XL1000 LED growing light provides the complete spectrum of light that naturally comes from the sun. This includes more Red, Blue, White, UV and IR light that your plants need with less Green and Yellow light that they don’t need too much. The Blue and Red heavy spectrum is better for vegetating compared to HPS lighting. But this is not the same for the flowering stage. However, this advanced color ratio increases the quality of buds and promotes THC production. The Kind K5 XL1000 offers the unique ability to separately adjust the intensity of Red, Blue and White light according to the specific growth stage of your plants. The instruction manual is a great source to find out the best percentages for many different plants. 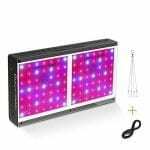 The fully customizable spectrum allows you to grow a variety of different plants under this LED grow light, which is something that most grow lights out there don’t offer. It’s a bit disappointing that Kind doesn’t provide PAR ratings. We understand that PAR ratings can be misleading at times. However, PAR ratings for hanging heights would be appreciated by many growers. Kind claims that the K5 XL1000 covers an area of 5 by 5 feet for plants with low light requirements, which can be misleading. Cannabis plants always require a lot of light! Therefore, Kind K5 XL1000 can only cover an area of 4 by 4 feet when it comes to growing cannabis. It’s important to remember that, most 1000w LED grow lights have the same coverage. So it’s definitely decent for a light of this size. 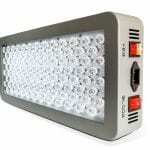 This LED grow light gives out around 2100BTU, which is very good for a light that consumes 630 watts. You can touch the light with bare hands, so it’s unlikely that this light will affect the indoor temperature. Although, lighting your plants from too close will definitely burn them. Power cord is very short. Still not sure whether to buy the Kind LED K5 XL 1000? Check out the video below to see it in action and to learn what others think of this Kind LED grow light. 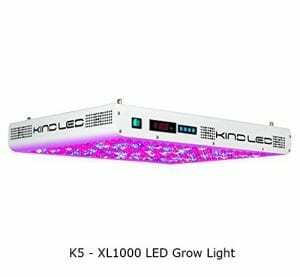 The Kind LED K5 XL1000 has been a bestselling LED grow light for multiple years. It has many awards to boast of and we understand why. The XL1000 does come with some imperfections like all other LED grow lights. Despite the name, this light doesn’t replace a 1000W HPS. If you can go down to replacing 750w HPS lighting instead, you’re going to love this light. It offers some truly advantageous and innovative features such as the customizable 12-band spectrum, ‘Mother Earth’ function and the highly capable remote control. It gives growers the complete control that almost all LED grow lights in this price range don’t offer. Kind LED K5 XL1000 is simply a superb LED light with amazing extra features. That’s the main reason for it being a bestselling LED grow light.